Have you ever had a dream where you felt like you were running down an endless corridor? Well, that is what the middle of Dark Matter by Blake Crouch was like. A little boring and frustrating. Fortunately, the endless corridor feeling was surrounded by some engaging suspense in the beginning of the story and a creative and exciting finish. 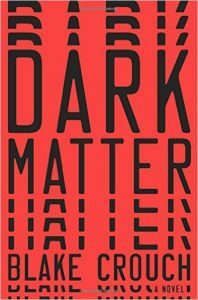 Dark Matter is a mystery, science fiction, and romance story. The main character of the story, James Dessen, is a college physics professor, once pegged as a brilliant up and comer, who traded fame and fortune for a happy family life. Some strange things start to happen and the reader, like James, is at a loss as to what exactly is going on. Did I mention that James was a physics professor? Yes, this is one of “those” stories, where science is used creatively to suggest an alternative possibility of what is real. Overall, it is very well done and serves the story well. I enjoyed Dark Matter and think it would make a fantastic movie.